The Ibanez GSR200-BK bass guitar delivers exceptional quality at an outrageously accessible price. 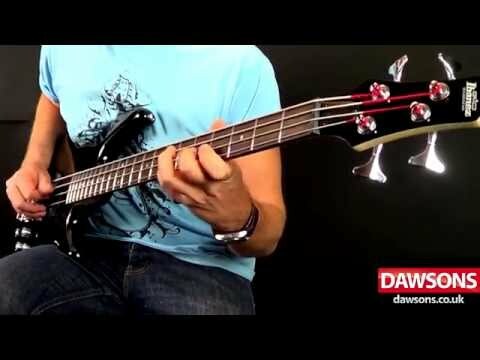 Since 1987, musicians all over the world have come to know the playing comfort and unique sound of the SR bass. For players on a budget who desire the same features as the SR, Ibanez GSRs offer the famous Soundgear sleekness, comfort, tone, and playability at prices that everyone can take advantage of. Ibanez know a thing or two about making sublime instruments. Whether they're fashioning Steve Vai or Meshuggah's latest signature models, or building the GSR200-BK, Ibanez have just a single-minded focus that is dedicated to making the finest guitar possible. The body is sleek, lightweight, and perfectly contoured to offer maximum playing comfort. The GSR200 is built using solid mahogany, a lightweight tonewood that shares similar tonal characteristics to the more expensive mahogany. Mahogany delivers a wide-ranging tonal output, with a low to midrange rumble served with smooth high-end shimmer. The lightweight nature of mahogany makes it much easier to wield, perfect for those who're developing their technical abilities, great for gigging musicians who want an easy to play bass. Ibanez necks are famed for their impressive strength across super slender profiles. The GSR has a maple neck that plays very fast, with a narrow shape that extends along its entire length. The double-cutaway body profile also lends itself perfectly to making each and every part of the neck easily accessible. Paired with the neck is a sublime rosewood fingerboard, home to 22-frets that is adorned with dot position inlays to help you navigate with ease. The GSR200 packs powerful Powersound pickups, delivering full tones with a strong low-end chug. The pickups are controlled with two volume knobs, a tone knob, and the exclusive PHAT-II bass boost control. By accessing the PHAT-II active circuitry, you can infuse immense low-end energy into your signal. Not only does this add an extra dimension to the tonal versatility of the already impressive picking pairing, but it allows your creativity to spread its wings. The GSR200-BK has the look and feel of models that carry a significantly higher price tag. The secure feel of the bridge, the impressive integrity of the tuning machines, the tonal versatility of the pickups, and the exquisite playing feel of the neck, all contribute to make a bass guitar that will stand by you for many years to come. Posted on 09/03/2019 by tom in my opinion you should get this bass its a really good bass and cheap too it feels nice in the hands and an overall good bass. Posted on 08/09/2018 by Reverend Bob I've played bass for 54 years; have had too many to count. But I wouldn't hesitate to gig with this lady. She's light, good neck; has sound versatility. For the price this axe is more than a winner. Posted on 13/01/2012 by EddieMoocha I've owned this guitar for about 8 years now and it has never let me down. The build quality is great and it sounds awesome, plus I’ve never broken a string on it. Obviously I’ve had to change strings now and again due to age of them, but that’s it. Also I had to lower the strings nearer the fret board a little as they were quite high, like all new guitars, but it’s an all-round excellent guitar. I've played in several bands since getting this guitar so it’s had a good hammering and I still use it now for my current band 'The Fiction Section'.